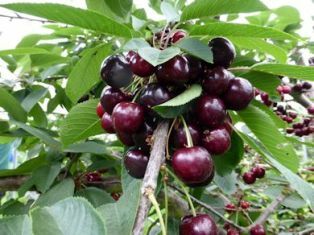 Its time for English Cherries again and The English Apple Man attends the funeral of Lord Mayhew of Twysden. 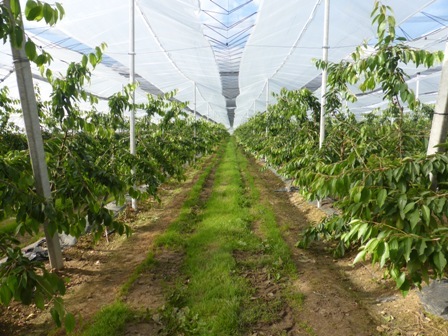 On Tuesday evening, The English Apple Man joined members of East Kent Fruit Society at Ledian farm in Leeds (near Maidstone) in Kent for a farm walk around Tim Chambers cherry orchards. On Wednesday I accompanied my friend Sarah Calcutt - Chair of The National Fruit Show to the Funeral Service of Lord Mayhew of Twysden who delivered great service to our country and in retirement became President Of The National Fruit Show. After some recent changeable weather, Tuesday evening turned out to be fine & sunny for a most educational and enjoyable EKFS Stone Fruit walk at Ledian Farm. Tim Chambers welcomed EKFS members and we were informed of the recent history of W.B.Chambers; a family run business that has grown rapidly in recent years. Tim with the aid of his 'right hand man' Saleih has managed the growing and marketing of multiple soft and stone fruit crops on multiple sites with commendable skill and entrepreneurial flair. 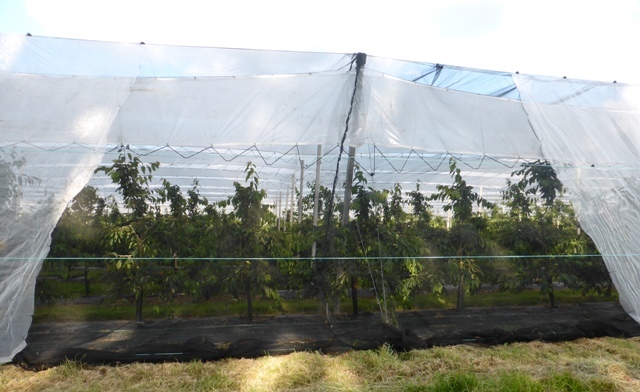 This was a very interesting walk with a selection of young cherry orchards aged 1 to 5 years. 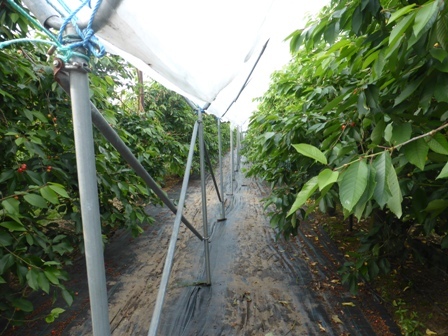 Some of these orchards are under Spanish poly tunnels and others are under a more permanent concrete post and wire system. 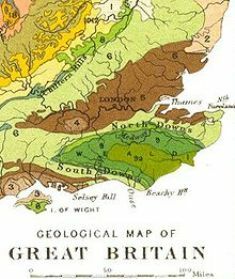 W.B.Chambers grows 130 hectares (312 acres) of Raspberries - 25 hectares (60 acres) of Blackberries - 20 hectares (48 acres) of Cherries - 20 hectares (48 acres) of Rhubarb and 5 hectares (12 acres) of Blackcurrants & Redcurrants. 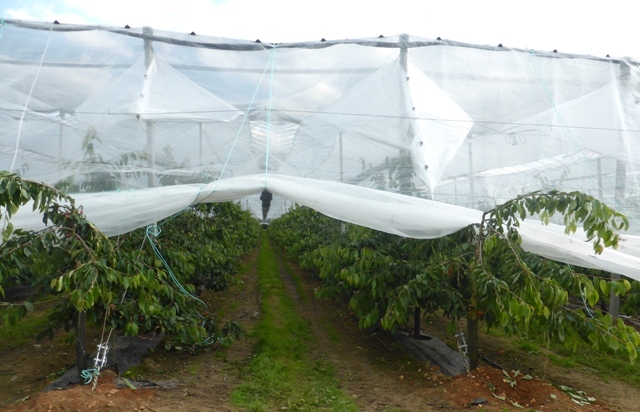 Tim Chambers describes the concrete post & wire support system used on the cherries with plenty of head height (air space) as a mixture of manufactured systems, 'blended' with Chambers innovation. Asked the question - how much does this cost? 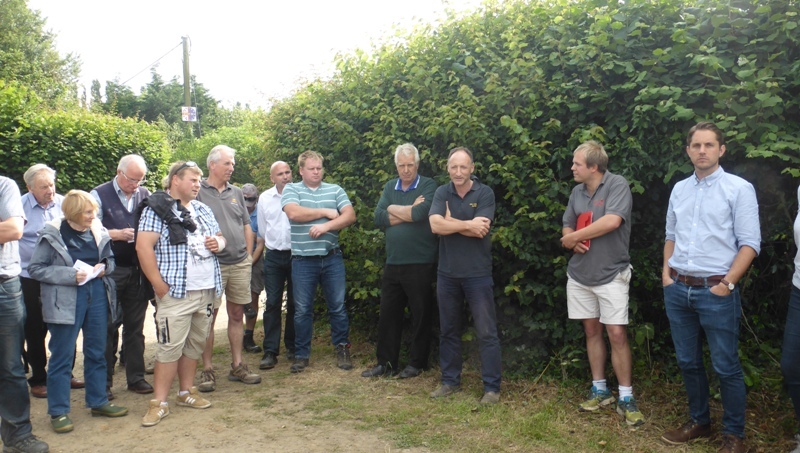 Tim smiled and said 'too much' - The English Apple Man consulting experts on the walk estimates £40,000 a hectare! After spending time in the Chambers 'style' tunnels, EKFS members moved onto the Spanish tunnels. 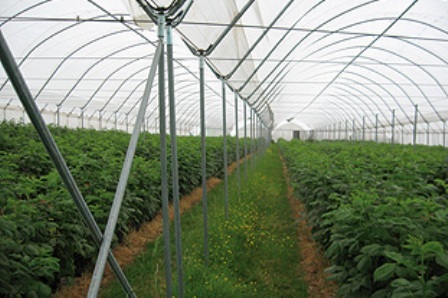 Spanish tunnels were by definition developed in Spain with Strawberries as the target crop; however this type of tunnel has been used for many 'under cover' crops including Raspberries and Cherries, although they benefit from more air space. 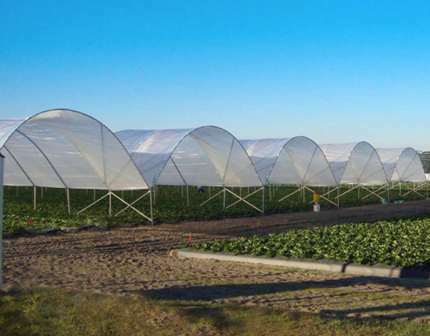 The cost per hectare? circa half of the post & wire system. 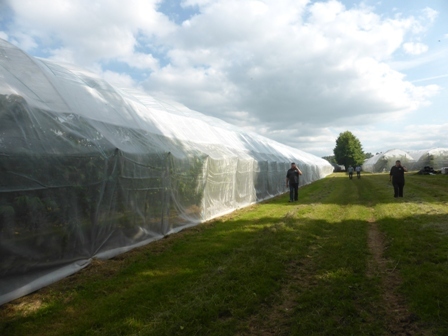 Ledian farm sits on the greensand ridge and its soil is good for top fruit production. 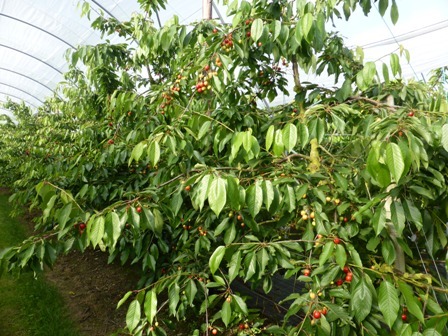 Cherry varieties grown at Ledian farm include; Regina, Penny, Kordia, Sweetheart, Stella, Summer Sun, Skeena. 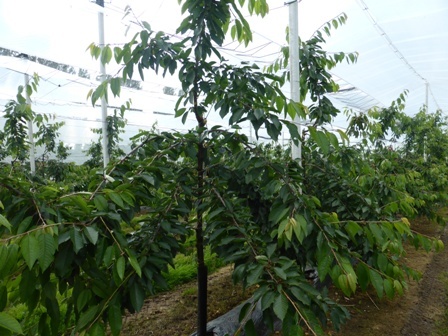 The oldest trees; 10 - 11 years old and most rootstocks are G5 (Gisella 5) with some G6. 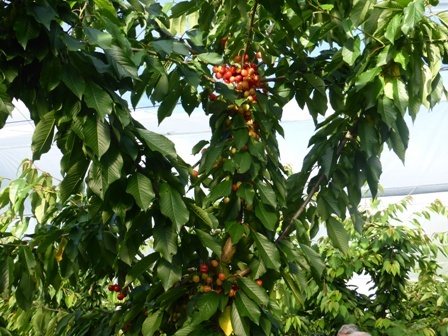 Tim said they initially grew some of the early varieties, but with competition from Turkish and Spanish cherries, they moved to later varieties. 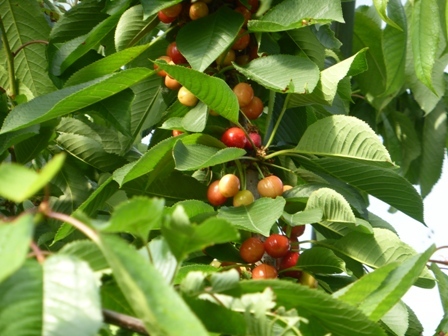 Kordia is the favourite variety due to fruit size and quality. Penny always looks good at blossom time but lucky to set 15% of the potential; Tim said it needs a constant 'renewal pruning' of wood in the tree as the older wood does not crop as well as younger 2 year old branches. Sweetheart flowered in April before the very cold Bank Holiday and shows the best potential for this year. 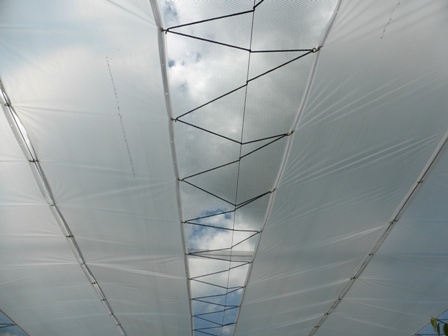 Tim feels later sites generally have slightly better yields. He also mentioned Korvick - a variety from the Kordia breeding programme. 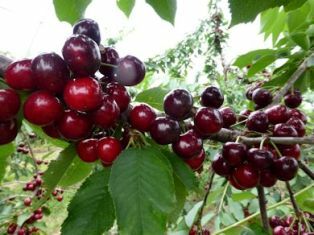 This year has 'generally' been a poor year for pollination and Tim expects 50% of the normal cherry crop which will equate to around 120 - 130 tonnes of cherries at Ledian farm. This will vary from variety to variety. Tim displays a strong sense of humour and likens growing cherries to visiting a Casino, playing Roulette but NOT being able to bet on 'the red or the black' - still his ambition to grow 250 tonnes of cherries each year to 'earn a seat' at the marketing table has not been dismissed - another 'aside' concerned tree death - he reckons 5% die each year, which means (he said) over the lifetime of a cherry orchard all will need replacing at some stage! On Wednesday at the Parish Church of St. Mary's in Goudhurst, Kent; the funeral of one of the most respected politicians this country has been blessed with in the last four decades was held in a Church packed with members of his family, friends and parishioners who appreciated the 'great man' in their midst. Patrick Barnabas Burke Mayhew, Baron Mayhew of Twysden was born on 11 September 1929 and passed away on 25 June 2016. Over the years we would very occasionally cross paths in the locality and he was always charming and patient in conversation. 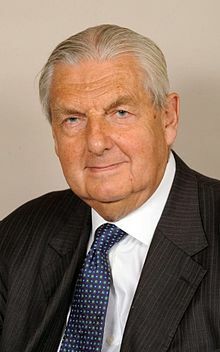 I remember at the height of his responsibility as Secretary of State for Ireland seeing him in Cranbrook in Kent calmly visiting shops in the high street; initially my thoughts....crikey that's brave..but as I watched I noticed two bodyguards with him; one systematically entering each shop before he entered with the second close by his side.